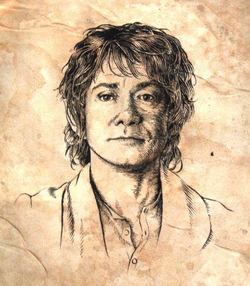 Interview with Gobla (Bilbo Baggins). I: Whats your in gaming name? I: Nice to meet you Gobla, where are you from? G: Ohh im half Turkish and half persian. I: Well how old are you? G: I am 17 and living in Dubai. I: What do you think about The Misty Mountains Production set? Do you think it will benefit Windfola server in any way?! G: It’s not going to be an easy job, but of course it will benefit Windfola. I: In what way it will benefit Windfola server also? G: I didnt ever saw any server do a big production like this before. In my 5 years of playing lotro. then if we (Windfolians) do it. Of course it will benefit us and make us one of the best and famous servers in one move. I: In this production which character are you performing? G: I am performing Bilbo Baggins. I: How do you feel about it, being one of the main characters, is it a burden for you? G: Its so cool. to be one of the main characters, and its not a burden for me. I like to do it! I: How do you felt, when they offered you this huge role? G: In the beginning I tought it was a joke and we wouldn’t be able to do it. But when i saw other people joining in and they liked the idea. I felt some hope in me! I: Mr.Gobla thank you for your time and you honest answers, hope to see you soon and hear from you again soon! G: Thank you for your time to ask me, see you soon! Interview with Brenter (Gandalf the Gray). I: Well if it isn’t Brenter the White of Windfola, good to have you here with us! B: (laugh) Thank you! You honour me with your movement, good to be here! I: So tell us, how comes people granted you the title of a White Wizard? B: Well it’s long story, I am a role-player also I’ve been in service of the Leaders of many kinships around the server, also I am always happy to help everyone in any way that I can! So this is how mostly people started to call me like that! I: So good to have a hero here, so you’re the Leader of The Crusaders right, what made you want to make a production of that huge-size? B: Thank you for your kind words, well The Crusaders have been doing movie production of their own plenty of times, we thought why not make one more, but this time include more people in it…more Windfolians?! I: What did people think of this idea? B: Well many folks liked the idea and wanted to join the production spot, others just wished us luck, and made no further comments, but it will be nice if we had more people with us! I: So what should we expect on the movie? B: Well plenty of things, actually it would be nice if it would be a huge movie, but sadly LOTRO doesn’t allow us to have more emotes to use in game. Well the movie will be a memorial of The Hobbit movies, and it’s aim is to promote LOTRO the Lord of the Rings and Windfola also! You will see shots in Tuckborough, where Bilbo will start his adventure, in Bag-End, exactlly in the insider rooms of Bilbo’s house. Then the fellowship will head to Bree-Land for some battle shots, in Lone-Lands, Rivendell and then to the Misty Mountains. I: It seems that you are really occupied with work. How do you feel of performing Gandalf? I: Will there be a second part? I mean should we expect “ The Desolation of Smaug” also, after the “Unexpected Journey”? B: Good question, well so far nothing is sure, we are taking some shootings at the moment for the first movie part, but I will let your imagination fly! I: Thank you Mr.Brenter, for your time! B: You’re welcome, take care!